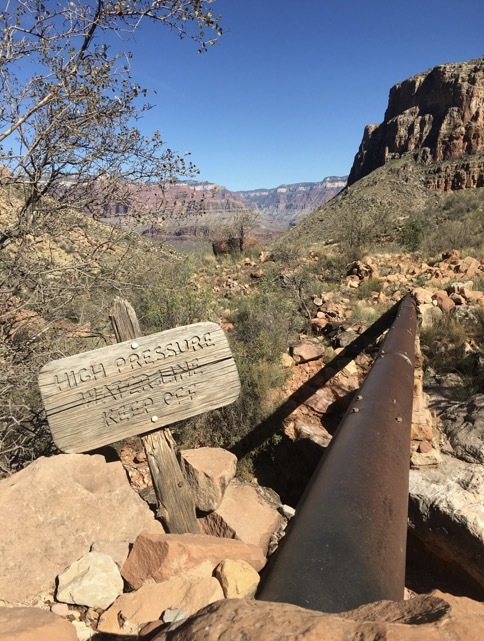 Like when planning a stay at Phantom Ranch on the Colorado River in the Grand Canyon, hiking Rim-2-Rim (R2R) presents 2 significant challenges: training and planning. You can train heavily but if you can’t secure the highly sought after lodging reservations, you can’t go. And of course, once you’ve scored the reservations, your event will be much more successful if you condition for the 20+ miles in 1 or 2 days and 5,000-6,000’ gain/descent challenge. The many planning decisions are interconnected: when to go, what direction to hike, and whether to do it in 1 or more days are the first issues to consider. Our Rim-2-Rim route began near the top of this Grand Canyon topo & ended at the level of the "You Are Here". Being intentional about when you do Rim-2-Rim can be a life-and-death choice. Snow and ice can be a show-stopper on the North Rim at 8,200’ if you aren’t prepared for it and the over 7 miles on the valley floor at 2,400’ could be 120+ degrees with no shade and limited access to water. Unless you have some one dropping you off and picking you up on opposite rims, you’ll need lodging on at least one side and ideally, both. Lodging is only readily available from May 15 - October 15 on the North Rim. Camping there after October 15 is possible, but it could be unexpectedly eliminated by early snowfall. Our only viable option was to make our crossing between October 1 -15 and in hindsight, it seemed like the ideal interval. The park service recommends May, September, and early October as the best months to be on the North Rim trail because of the valley heat. Snow did fall on the North Rim the afternoon of our crossing on October 8, 2016 and we encountered uncomfortable temperatures in the low 80’s in the valley on the same day. A few days later, it was 94 degrees at Phantom Ranch, the low point in the valley. Searching “noaa phantom ranch az” is the quickest way to locate a forecast for Phantom Ranch. Going directly to NOAA is tedious and, in our experience, other sites that proclaim to have the Ranch forecast instead report a rim location. The best way to assess if you actually have the Ranch is to look for the typical 20 degree difference between the rim and the river reports, day and night. It helps with your last-minute planning to know how hot it will be in the gorge. Avoid the Columbus Day weekend in early October and other holidays to make already difficult-to-obtain reservations a bit easier. Factor in the driving issues, like where you are coming from and going to, to aid in your direction decision because the distances are long between regional destinations. Otherwise, it’s a toss-up as to which direction to walk. The N Kaibab is the big-gain trail and you may have a preference for going up or going down it. The N Rim is off in the distance; the green patch is Phantom Ranch & the muddy Colorado is barely visible in 2 places. We did north to south the first time strictly because of the reservations we could procure. We planned on hiking from our parked trailer on one rim, making the crossing, spending 1 night in a hotel on the destination rim, and taking the shuttle back to our trailer. My goal was to book campgrounds and hotel rooms on both rims for 2 weeks each and we’d let availability dictate our direction. I wasn’t able to book a room on the north side so that settled it, we’d hike from north to south. Which Trails Are The Best? The North Kaibab trail is the only trail north of the Colorado River that connects the valley with the North Rim. It’s 6,000’ of elevation gain. There are 2 choices on the South Rim, the South Kaibab and the Bright Angel Trail, both with about 5,000’ of gain. For first-timers, the Bright Angel Trail is the definitely the best bet on the south side, up or down. It’s a little longer than the S Kaibab but the Bright Angel isn’t as steep, though it has an average grade of 10%. Bright Angel potentially has 3 water spots and has shade—the S Kaibab has no water and little shade. Bright Angel also has more people on it, which could be advantageous in a difficult situation. The S Kaibab is gorgeous but can be brutal and hot, even in the winter. We took the Bright Angel Trail up for our first crossing and intend to take the S Kaibab down for our second effort. For us, it was a no-brainer, we’d make the crossing in 1 day. Several struggling backpackers thought we were real animals for doing it as a long day but clearly hadn’t thought through the trade-offs. Neither of us have the backs or knees for backpacking, especially on steep trails. Carrying less than half or a third of the weight of overnighters, and keeping it moving, was a winning plan for us given the 5,000' and 6,000’ ascents/descents. Another advantage of through-hiking is that it is the only way you can make the journey without a permit— you just show up and do it. A look at the mid-level of the Bright Angel Trail from the South Rim. 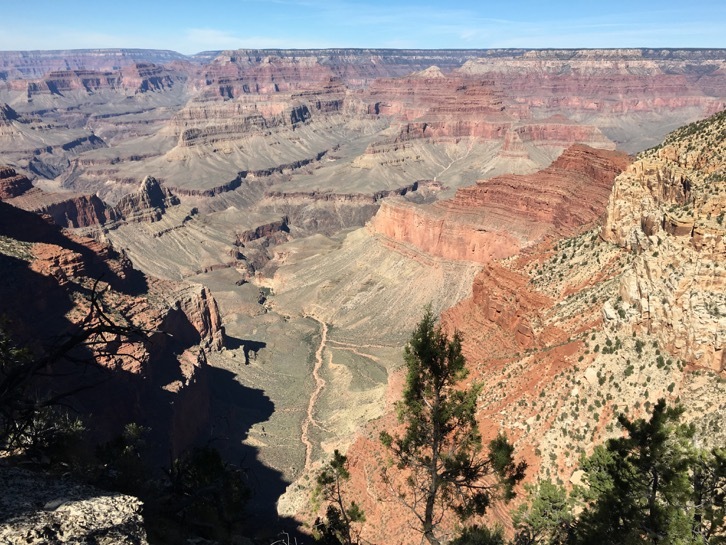 There are 3 campgrounds in ‘the corridor’ that Rim-2-Rim’ers use: Cottonwood, which is roughly 7 miles down from the N Rim; Bright Angel by Phantom Ranch at the river on the north side; and Indian Garden about half way on the Bright Angel trail on the south side. Most of the overnighters we spoke with either spent 2 nights at each of the 3 campgrounds so as to rest and/or explore or made a 2 day crossing by spending the night at Cottonwood, usually going south to north. Camping several nights does allow one to have a much more in-depth experience of the inner canyon than through-hiking and that may have been a big reason for those who chose to camp. 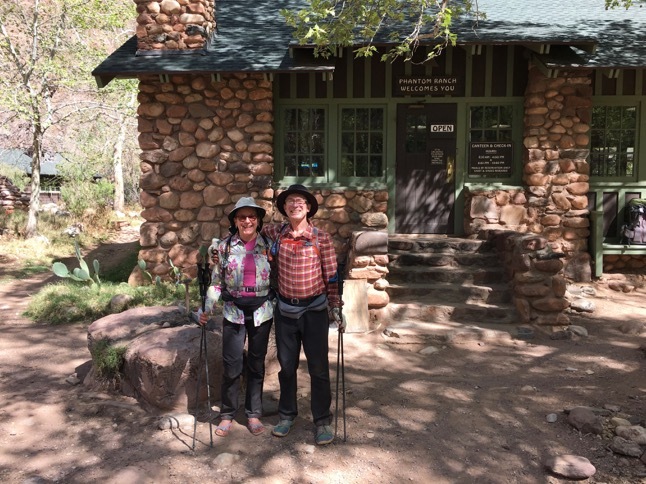 We had the privilege of having spent a total of 9 nights over 3 years at Phantom Ranch and had used 6 of those days for day hikes from the Ranch on the north side. We already felt like we’d had enough time to savor the inner canyon and didn’t feel like we were missing much as through-hikers. 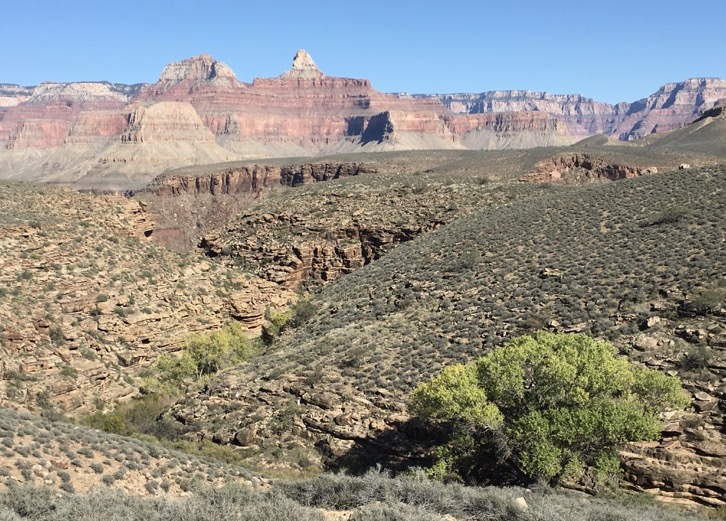 A clever, intermediate solution that I haven’t heard anyone use, is to camp at Bright Angel Campground and pay, $73 each way, to have a mule haul your camping gear down and then up the Bright Angel Trail the next morning. You still need a Backcountry permit for the campground but you can split the crossing into 2 days with 30 lbs less on your body. The rules are strict: 30 lbs max with dimension limitations and the gear cannot be in a frame pack or suitcase—it needs to be in a duffle or duffle-like bag. This could be a great equalizer for couples or groups with differing abilities. Bill always enjoys a cup of coffee at the Phantom Ranch canteen. We’ve used the mule service round trip 3 times (back when it was $60 + tax) when staying at Phantom Ranch and it was highly reliable. Look to our Phantom Ranch “In More Detail” piece from 2014 (http://detail.travelfit.us/page13/index.html) or the park service website for details on reservations for the duffle service. There is a third, extremely-hard-to-implement overnighting option, which is to spend 1 or more nights sleeping indoors at Phantom Ranch. That is the dream-option for first-timer R2R’ers. I spent dozens of hours on the phone each year that we stayed at the ranch to book beds. I was only able to secure reservations by being willing to take almost any night over about a 6 month time span. Aiming to get a specific night that fits with your ideal hiking calendar is a daunting task. Settling for beds in the 10 bed dorms is easier than booking a cabin. Our Phantom Ranch piece noted above has all the details for making reservations and being a guest at the ranch. For both a Phantom Ranch visit and doing Rim-2-Rim, reservations for sleeping indoors are the hardest to procure but camping spots are tight too. Some reservations can be booked a year or more in advance, others only have a 6 month window or less. We quickly learned that the fate of our Rim-2-Rim epic hike was 100% dependent upon getting the needed reservations when we wanted them. More on reservations below. If you aren’t already hiking at the 20 miles in 1 or 2 days level, prudent conditioning could take 6 months or more. When training for a marathon back in the late 1980’s, I was told it takes about 6 months for soft tissue (muscles and connective tissues) to adapt to a big increase in output, or a new activity, without injury. 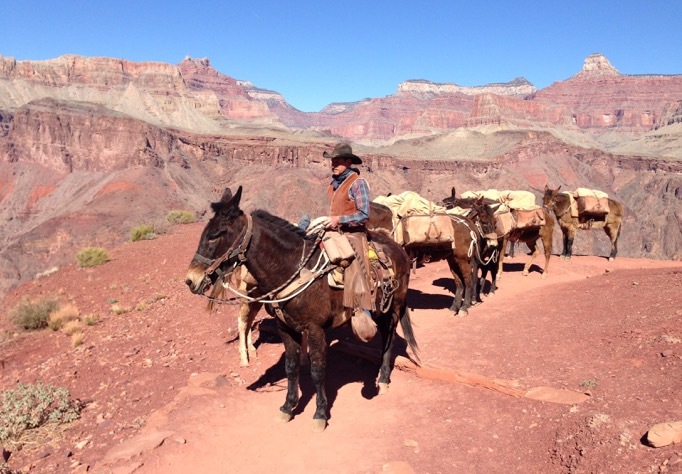 A mule train coming from Phantom Ranch on the S Kaibab. We had the luxury of time to train for our first R2R. 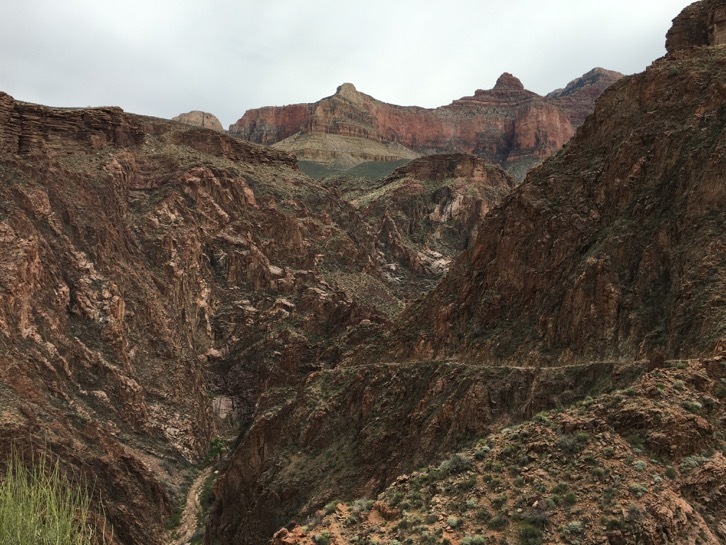 In March, we hiked from the South Rim to Phantom Ranch and back up again in 1 day (20 miles, 5,000’ gain). It was the first time we’d done that all-or-nothing loop and the the first time we’d done so many miles. We were exhausted and brain dead, but we were thrilled with our unrecognized capacity. We immediately set an intention do a 20 miler once a week for the next 7 months and given how depleted we were after the first one, it wouldn’t be hard to tell when our bodies had adapted to the new distance. We were increasing our usual long hike from 15 to 20 miles and definitely felt the strain the last 5 miles, and all that evening, each time we did it. We did however feel a significant improvement in our comfort and recovery after a 20 miler at the 5 month point. We were lucky, we still had 2 more months of training time after that to really anchor the tissue and metabolic adaptations. We didn’t achieve our goal of weekly 20 milers but made about 2/3’s of the hikes. We felt confident that we were well conditioned by the time we made the crossing in early October. We did do massive amounts of intense myofascial release to support our tissues during our training. As it was, ours was a 27 mile day with the extras of walking to the trailhead in the morning and to our distant hotel in the evening. Not only did we push our endurance, we pushed on our speed, both ascending and descending, in our training program. It’s a long journey and even with pressing ourselves to maintain tempo, our moving time was over 10 hours. Well-trained, younger athletes do it in 8 hours; we spoke with others who took 15-16 hours. 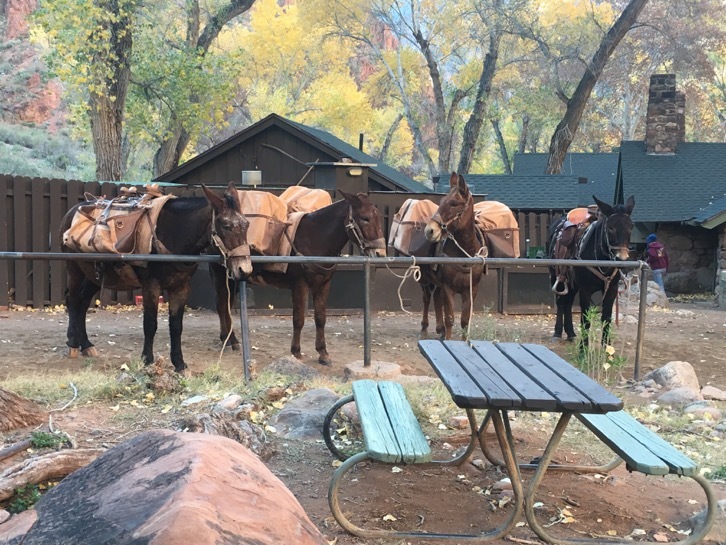 Part of a mule train hanging out at Phantom Ranch. The unique opportunities in the Grand Canyon for R2R’ers are the 3 different speciality shuttle services. As explained above under “Camping", there is the very pricey mule duffle service for which you can pay to have 30 lb loads hauled to and/or from Phantom Ranch. We used this for Phantom Ranch stays and loved it. The service is exclusively between Bright Angel Lodge/mule barn on the S Rim and Phantom Ranch at the river. It can be used by anyone but pre-paid, advance reservations are required. It’s probably only useful if you spend a night at the ranch, but it allows for other creative options too. At www.transcanyonshuttle.com you can book a ride for you or your unaccompanied luggage between the North & South Rims, either or both directions. Their hiker service is twice a day each direction May 15 through October 15 and drops to once a day through October 31. Unlike everything else in the Grand Canyon, you only need to reserve your seat a few days in advance to be guaranteed a ride—they keep adding vans to accommodate all requests. In addition to these specialty shuttles, there are ‘on-the-rim-only’ buses. The South Rim has an extensive free shuttle system that operates year round. The first Orange line bus going from the Visitor’s Center to the S Kaibab trailhead leaves at 5:00 am during R2R season and it is only a 7” ride. There is a Hiker’s Express that leaves from Bright Angel Lodge that only makes a few stops on its way to the S Kaibab trailhead though in the fall, it starts 1-2 hours later than the Orange route. And there are several other lines that might connect the dots for you. On the N Rim, there is a for-fee shuttle from the Lodge to the N Kaibab trailhead. There are other private companies and guide services that may be able to offer you more transportation options should you need them. 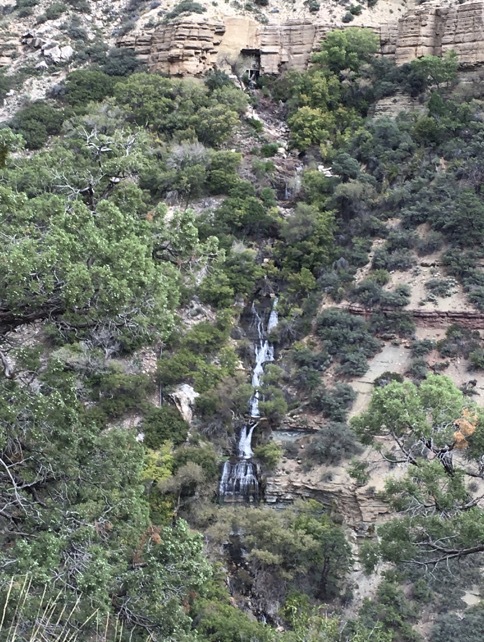 The Bright Angel Trail is in the narrow gorge outlined by the cottonwoods. We hatched our plan to do Rim-2-Rim in March and quickly realized that our only option was to do the crossing the first half of October. October 1st was the earliest date we could arrive given our summer plans and we didn’t want to navigate around closures on the N Rim starting October 16th. Fortunately, it looked like a good compromise between the possible searing heat in the valley and freezing nights on the North Rim. We have a trailer which, like tent camping, creates more lodging options at the Grand Canyon than only relying on hotels. 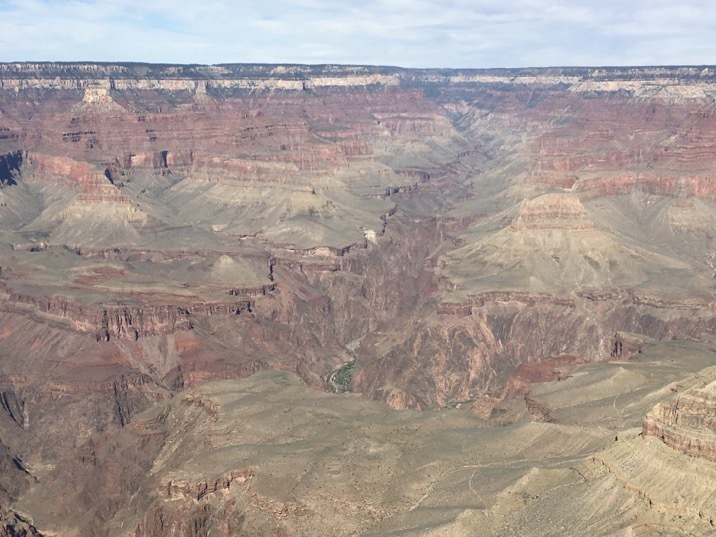 I set out to make 2-week-long reservations at a hotel and at the RV park on the South Rim and a hotel and the more basic park service campground on the North Rim. The concurrent 2 week windows of bookings at each of the 4 locations would allow us to select the best weather day for our event once we were close to the Grand Canyon in late September and to make a last minute decision as to which direction to hike after we had learned more. But given it was March, I was already too late for a hotel room on the North Rim, everything was full, and I was too early for a campground there. The Trailer Village RV Park on the South Rim still had openings but I had to go with one of the more expensive hotels on the South Rim to get anything. The only room available was almost $200 for 1 night, but I was glad to have it. Like with Phantom Ranch where we had stayed in the past, the cancellation policies for all my bookings were very generous. I had to pay deposits everywhere but almost all gave a 100% refund with 48 or 72 hours cancellation notice before arrival. Only the inexpensive park service campground on the North Rim, where I eventually was able to book, had a $10 penalty for every reservation change. I did have to finalize our dates before we drove to the North Rim because we couldn’t count on having cell or internet access to drop reserved nights. The steep, lower section of Bright Angel Trail. If I’d persisted and called daily for months looking for a cancellation in a North Rim cabin, I might have been able to get one but I’d worn myself out doing that for Phantom Ranch in the past and accepted what I had. We were thrilled to be in the game at all. I had a package that would work: acclimate on the South Rim where the best services were; drive to the North Rim to stage our hike; spend 1 night in a hotel on the South Rim after the crossing; take the shuttle back to the North Rim; depart the area to the north. I kept all of the 2 week bookings at the South Rim hotel and the RV park as well as the North Rim campground and waited until late September to make any more decisions. Starting the last week in September, we began watching the weather forecasts for Phantom Ranch and the rim for a sense if there would be a good weather window at all. Early snow or persistent storms would have killed our plans for 2016. At the end of September, before we arrived, I started cancelling reservations 2-3 days at a time as we pushed our crossing date out. We wanted the best balance between good weather, time to acclimate, and not being too rushed before or after the event. Then it was commitment time: we had to pick a single date because of the expense of forfeiting the hotel room dates. The die was cast for October 8 and we drove to the N Rim on the 5th. Unfortunately, the next day, a 20% chance of rain was in the forecast for our date after the rolling 10 day forecast had been entirely dry for more than a week. Best laid plans…. We didn’t get soaked, but we had an impressive thunderstorm overhead for about a half an hour and finished the day in the dark and damp. The short season for food and lodging on the North Rim is May 15 - October 15 but they have a long booking season. Forever Resorts reservations for North Rim lodging for 2017 opened July 1, 2016. You can book online with them at www.grandcanyonforever.com/lodging and by phone at 877-386-4383, 7 am - 6 pm MST. There are 4 different cabin/motel options with additional price subsets reflecting the view. The before tax prices range from about $135 to $230, all with private bath. They have a 72 hour cancellation policy. Xanterra Parks & Resorts operates Bright Angel Lodge, El Tovar Hotel, Kachina Lodge, Thunderbird Lodge & Maswik Lodge on the South Rim. They are all in close proximity to the Village hub, Bright Angel Lodge. Contact them at www.grandcanyonlodges.com/lodging or 888-297-2757 from 7 am - 7 pm MST. Delaware North operates Yavapai Lodge & Trailer Village. Book at www.visitgrandcanyon.com or 877-404-4611. The Lodge rooms have all been remodeled and run about $150-200. We stayed at Yavapai Lodge and enjoyed the room. The mini-tub was welcome after the crossing and we appreciated the mini-frig and coffee maker as well. This is the only lodging that is far away from the Village hub (close to 2 miles) but it is very close to the market. We chose to walk from the Bright Angel Trailhead near the Lodge to our hotel after completing our crossing but the free bus services from both Bright Angel and S Kaibab trailheads run until about 9:30 pm. The inexpensive park service operated campgrounds can be booked at www.recreation.gov. You can also call 877-444-6777. Reservations can be made 6 months in advance for these campgrounds. Mather Campground is located on the South Rim and is open year round. The North Rim Campground is open fully open May 15 - October 15. The N Rim Campground remains open from October 16 - October 31 with reduced services. On November 1, the campground then reverts to a primitive campground with no water until May 15. Backcountry permits and reservations are required during this time. From October 15 through December 1, the park is open for day use or until snow closes State Hwy 67 (so a driver could pick you up if you walked south to north). There is year round access for hikers and cross country skiers on the N Rim with a Backcountry Permit but there is no road access. There are no hook-ups at either federal campground but both have dump stations and coin-op showers and laundry within walking distance. For expediency on the N Rim, bring your own quarters for the showers. Trailer Village on the S Rim is the only full hook-up campground in the park BUT your sewer line can only be out briefly or it will be punctured by the hungry ravens. There are no showers in the RV park though coin-op showers are available a 10 minute walk away, near Mather Campground. Most of the sites have limited cable TV access and the sites run about $47/night. No tents are allowed. We’ve stayed there many times and enjoy the spacious park that is a 15 minute walk from the rim. 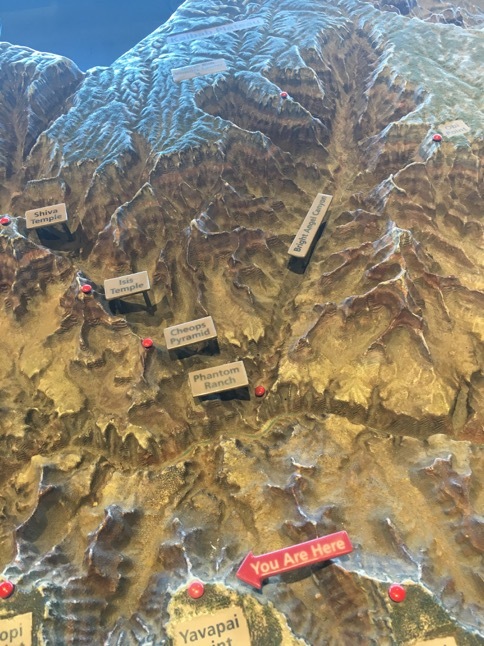 It’s managed by Delaware North and the website is www.visitgrandcanyon.com. You can also book at 877-404-4611. You can cancel with full refund 72 hours before check-in. After your first night however, you can cancel any unwanted reserved dates when you check-out, without penalty. The Park Services's latest attempt to stress the dehydration hazards. There are 5 potable water spigots on the N Kaibab, 3 on Bright Angel, and none on the S Kaibab. Only 1 spigot on each side runs year round (Phantom Ranch at the river and Indian Garden). On the north side, Supai is not reliable and Roaring Springs is a detour below the main trail. None of the water supplies are guaranteed to be operating when you arrive but it’s good to check for an update on failures at the Visitor’s Center on either rim. Breaks in the 50+ year-old pipeline designed to last 30 years are a frequent occurrence. We carried 2.5 - 3 L of water each and refilled at Phantom Ranch and Indian Garden. We anticipated refilling at Cottonwood but the heavy cloud cover kept us cool on our descent. It started drizzling shortly after we left Indian Garden but on a hot day, we might have refilled again on our way to the top of Bright Angel Trail. We learned the hard way during day hikes from Phantom Ranch that the valley can suddenly feel desiccating because there is little relief from the sun when it starts heating up the inner canyon floor and walls. In addition, when you start climbing out of the canyon, you may abruptly realize you are significantly dehydrated because of your hours in the valley. Being a very rare down-then-up trail also tends to make one’s prior judgments about their water needs inaccurate. For those reasons, it’s best not to cut your water supply close until you have experience with the hazards on these particular trails. We both add sodium to all of our drinking water to counter the heavy salt loss when hiking at altitude, in the heat, and in low humidity. (Very roughly, we use about 1/2 tsp of table salt per liter). Bill also adds extra salt to his food. Because of our ketogenic diet, we also need more sodium than carb-eaters so, under extreme conditions, we’ll consume as much as 6 grams/day of sodium (not salt, but sodium). It takes time to learn how much more sodium one needs to counter the physiological stresses of an event like R2R but don’t expect a bag of nuts or potato chips to get you out of trouble. Carry a couple of tablespoons of table salt and keep it handy. As soon as you start feeling weak, headachy, dizzy, or spaced-out, shovel-in some salt anyway you can. If you add it to your water and it tastes good, keep adding it until it is unpalatable, then dilute it a little—that’s the best way to assess how much you need when you’ve gotten short. Keep up that level of intake, at least for the rest of the day. We also add an equal amount of potassium to our diet when our sodium intake increases. Of course, check with your doctor if you are on a sodium or potassium restricted diet. An exposed piece of water pipe above Indian Garden. We carried our water purifier with us on the crossing, which the park service strongly recommends. 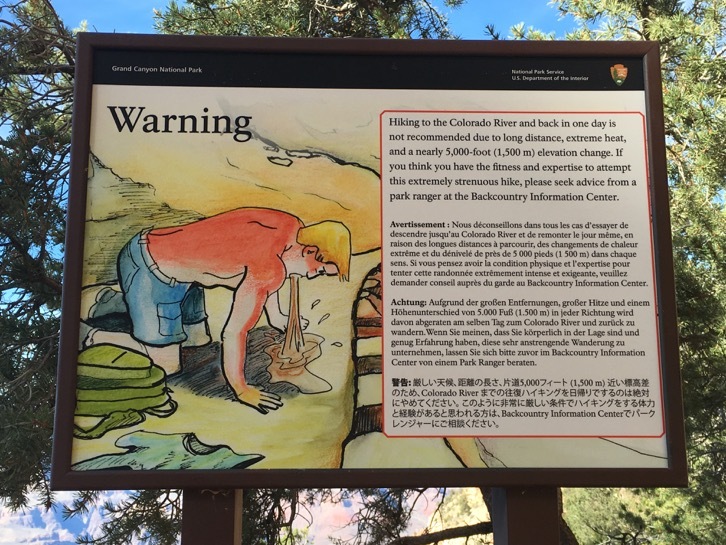 Because breaks in the pipelines are a regular occurrence (you’ll see water bubbling up from leaks under the trails), the park service urges that all who venture into the canyon be prepared to purify their own water. There are accessible creeks at several places on the N Kaibab and Bright Angel, though not on the S Kaibab. Of course, there is also the Colorado River itself though there is the infamous case of a hiker who died of dehydration 500’ from the river. Carry all of the food that you will need. Snacks and beverages can be purchased at Phantom Ranch from 8:30 am - 4 pm. You cannot however, buy a proper lunch. You can reserve in advance and prepay for breakfast or dinner but you must be there promptly at the booked seating for the fixed menu. They do not take pity on the ill-informed or those who over-estimate their ability. Both in overheard and in 1-on-1 conversations while hiking Rim-2-Rim, feet and knees were the top 2 pain areas mentioned and we actually heard more complaints about feet. One capable-looking man was limping along because of serious pain from blisters on the bottoms of his feet. He’d been fine doing Rim-2-Rim but it was doubling his event by hiking back to his starting point for a Rim-2-Rim-2-Rim that had been his undoing. He recognized one mistake he’d made: he’d trained in running shoes and did the hike in boots. Bill started having mild but unfamiliar foot pain and wisely thought to empty his shoes of sand and grit that was entering through the mesh in his shoe tops. Just dumping the pile of sand out of the shoe wasn’t enough however, he also needed to remove the insole and clear out the accumulations under it. That’s all it took for the odd pain to go away. It had been like having a metatarsal lift in the wrong position. I was only aware of one other person who used my strategy of changing shoes on the big hike. I wear my minimalist trail running shoes with hefty lugs for traction on the big descents (and for hiking by headlamp) and then switch into my minimalist sandals for the relatively flat terrain and the ascent. I noticed a middle-aged man picnicking near us swapping out his boots for running shoes, which was just before the 4-5 hours of ascending. Roaring Springs: The park's sole source of water. Shortly before our picnic at Phantom Ranch, a 30-ish, self-proclaimed power hiker was gaining on me and asked how I liked hiking in sandals. She thought they looked wonderful because the bottoms of her feet were aching in her running shoes. And another small group of speedy, light-weight hikers nearby had been talking about their feet as well a little past the half way point for the day. And then there were the others at watering holes who were sitting with their shoes off, some with substantial amounts of tape on their feet, and still others dunking their tootsies in a creek. Our Vivobarefoot minimalist trail running shoes are designed to be worn without insoles or socks so by taking both of those accessories along, we can have 3 different combinations of padding and pressure points with a single pair of shoes with little extra weight or bulk. We rarely change our from our starting combination but we ALWAYS keep the options in mind. In addition, I have my sandals, which can be worn with thin socks in a pinch, which gives me a total of 5 variations in my footwear. We are huge, huge fans of thin, light, and flexible footwear and believe that they are far superior to boots, especially on steep descents where utilizing one’s full ankle mobility can reduce the pounding and torquing on one’s knees. Of course, you shouldn’t make a significant shift in footwear before a big event because it can take months or a couple of years for the necessary shortening and lengthening of muscles to occur. Footwear selection should be one of the earliest decisions you make for your epic hike. Three weeks after our R2R crossing, we spoke with 4 hikers on the Pacific Crest Trail, 3 of whom were doing the entire 2,500 miles in 4-5 months. Like in the Grand Canyon, feet dominated the conversation when I asked about injuries. Knee problems were mentioned, but it was feet and shoes that triggered an onslaught of comments. None were wearing boots and 2 of the 4 were wearing Altras, a brand of minimalist shoes that we also favor. The National Park Service website is loaded with details, including lodging outside the park for both rims : www.nps.gov/grca. PS: Arizona, where the Grand Canyon is located, does not observe Daylight Saving Time. When PST switches to PDT, it is the same time in Arizona as farther west. Good luck with your planning & have a safe crossing!